How Eco-Friendly Toner Cartridges Can Help Your Small Business | TonerGreen - Eco-Friendly Toners from the U.S.
Laser printers are known to be commonly used in business environments whether in big corporations or small businesses. This is because laser printers are capable of printing high bulk of documents and are much faster compare to inkjet cartridges. But spending on your printing expenses certainly can be quite expensive and when your just starting a business, every cent that goes out off your capital funds matters. But what can you do? Printing documents are important in a business. Well, yes, it is important but you don't have to suffer from spending so much money in your printing consumables when there's a way for you to spend less. So before you pull those green bucks out of your pocket, you might want to consider this alternative and that's by buying eco-friendly toner cartridges instead of OEM (Original Equipment Manufacturer) cartridges that costs more. So what are eco-friendly toner cartridges? Eco-friendly toner cartridges are technically known as "remanufactured toner cartridges". These toner cartridges are used OEM cartridges that are reprocessed or refurbished and then are re-filled with new toner for re-sale, thus the term "eco-friendly toner cartridges" or "recycled toner cartridges". Buying eco-friendly toner cartridges can let you save up to 60% of your printing expenses. But don't think that although these cartridges are just refurbished ones, their quality are sub-par low than OEMs. These toner cartridges went under quality-control processes to ensure that they meet, or exceed their OEM counterparts. 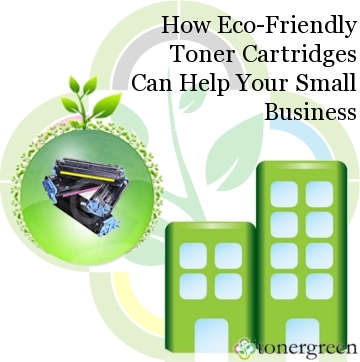 How can eco-friendly toner cartridges help small businesses? Basically, purchasing these eco-friendly toner cartridges can let you save more money which can be used on more important business expenses. Aside that it cost less than OEMs, online remanufactured toner cartridges retailers also provide coupons and discounts for consumers to save even more. And the best part is, aside from saving some bucks, you also get high-quality printouts the same as OEM toner cartridges can produce. Supporting these eco-friendly toner cartridges also help the environment. It conserves raw materials that are used in manufacturing new toner cartridges such as rubber, steel and aluminum. For each eco-friendly toner cartridge you used, 5 to 9 pounds of virgin materials are conserved. Eco-friendly cartridges let's your small business save some Green while going Green at the same time. TonerGreen.com, one of the leading providers of eco-friendly toner cartridges, aims to help you make eco-friendly choices for your office by providing environmentally responsible printing solutions. We offer a wide selection of premium-quality U.S. made remanufactured toner cartridges and remanufactured inkjet cartridges to work in your printer and provide consistent, high-quality output. 100% Satisfaction Guarantee!